Glentoran have lost their latest appeal against Glenavon's Premiership win at the Oval in November. In December, the Northern Ireland Football League said that they could not overturn the IFA's original decision to confirm's Glenavon's win. On Saturday, Sports Arbitration UK refused to overturn that decision. Glentoran are now mulling over whether to launch a further appeal to the international Court of Arbitration for Sport in Lausanne. Reacting to Saturday's Sports Arbitration UK verdict, Glentoran expressed "disappointment" and said that they were considering available options. "It is particularly disappointing that the ruling confirms the original IFA contention that clubs faced by ineligible players are considered to be a 'third party' and therefore ineligible to lodge an appeal," said the Glentoran statement. "We feel this sets a dangerous precedent that could detrimentally impact any club in much more serious cases than simple player eligibility. "The arbitrator has accepted our original contention - supported by both the IFA and NIFL - that Gary Hamilton was dismissed as a named player and that therefore he should have stood suspended for our subsequent game on 8 November. "The clear cut, unambiguous nature of the FIFA disciplinary code should clearly override any intangible notion of 'natural justice' in any such case." 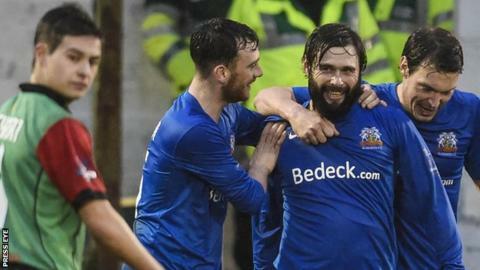 The controversy arose after Glenavon player-boss Hamilton played and scored twice at the Oval despite being ordered from the dugout a week earlier. After the IFA accepted that a mistake had been made, Hamilton was ordered to serve a two-match suspension, which started on 15 December.